Some letters are meant to be shared. Here’s one from a happy Olympic Hot Tub owner who suffers from a dry skin condition that was not made any better by using her hot tub. But, wait, she bought the hot tub for relaxation. What to do? Take the plunge and start on SilkBalance. I have a medical dry skin condition which requires that I use a prescription lotion twice daily. I cannot believe how wonderful the Silk Balance Water care system has helped me. Whenever I used my spa which I absolutely love by the way I always had to shower and apply my lotion before I could go to bed at night. I work 2nd shift so when I get home I want to get into my hot tub enjoy, relax all those tired achy muscles and sleep like a baby but when I have to shower, apply lotion it takes away from my relaxed feeling. These days since I started to use the Silk Balance Water Care System I can actually go to bed and not have to do my regimen until I get up in the morning and shower. My skin feels comfortable and not tight and dry any more since I finally got on board with the Silk Balance. I have had my tub for 5 years and its like having it new all over again. The other big bonus is how easy it is to take care of my Hot Spring Jetsetter now, no more weekly checking the water PH, adding this and that chemical to balance everything out. The secret to true happiness is a good sense of humor and a bad memory says Dian. Well her memories of how her skin felt before SilkBalance are vivid, I’m sure. So why put up with dry, itchy skin? Why put up with balancing and mixing and testing and all of the other things associated with hot tub use the old way? 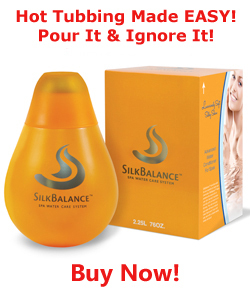 SilkBalance is the answer to your hot tub prayers. Simple, safe, natural. No more odors, dry skin, chlorine-red eyes. Make the switch to SilkBalance today! There’s a money back guarantee if you’re not completely satisfied. You have nothing to lose but dry skin, stinky water and endless hassles.